Since we have a fixed amount of time to equip our children for the future, we need to be intentional about raising our kids to turn out right. God left us a comprehensive plan based on the amazing power of His grace. 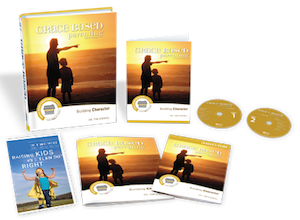 In order to take on the future with confidence, our children need a decisive and specific faith in Christ that helps them make good choices. When integrity becomes second nature, our children will have a much less complicated, challenging life. Poise is a compassionate gift we can give our children to help them balance between the extremes of life. Disciplines are those tracks we put under our children's strengths that help them achieve all they were meant to. We need to develop endurance in the hearts of our children so they won't give up when life gets tough. All kids have fears and weaknesses. Courage is what we build in order to help them triumph over them. 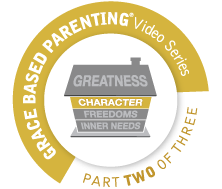 How do we know if our kids get it when it comes to character building? When we let them put it into practice. Designed dilemmas are basic training for life and move character from a lesson to a lifestyle. Sometimes we are our own worst enemies when it comes to building character into the hearts of our children. We'll learn how to get our act together, so God can work on our kids. Sometimes the biggest obstacle to great parenting is how we were raised. When it comes to raising kids who turn out right, the past does not have to determine the future. We will learn how to raise our C-Quotient as we deal with the people and events of our past that want to undermine our role as a loving parent. With God's help, you can build character for a lifetime in the hearts of your children.